Check that your 20mm axle and pinch bolts are properly adjusted and tightened to 19 in-lb (2.1 Nm). Inspect the entire exterior of your fork. The fork should not be used if any of the exterior parts appear to be damaged. Contact your local dealer or FOX for further inspection and repair. Check your headset adjustment. If loose, adjust it accordingly to your bicycle manufacturer's recommendations. Check that all brake cables or hoses are properly fastened. Test the proper operation of your front and rear brakes on level ground. Before every race or ride, clean the outside of your fork with only mild soap and water, and wipe dry with a soft dry rag. Do not spray water directly into the seal/upper tube junction. Do not use a high pressure washer on your fork. NOTE: Pressure measured at an ambient temperature of 70-75˚F. Normal operating temperature range for FOX products is 20-140˚F. 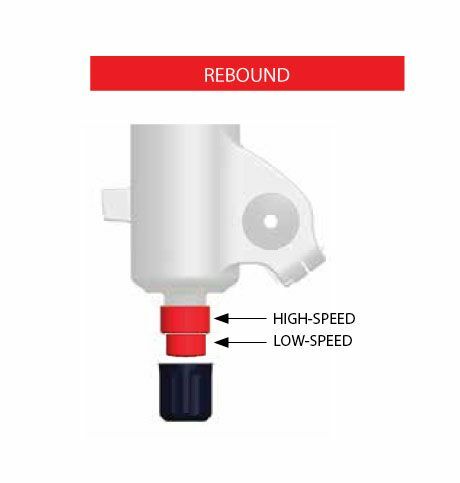 To achieve the best performance from your FOX suspension, adjust the air pressure to attain your proper sag setting. 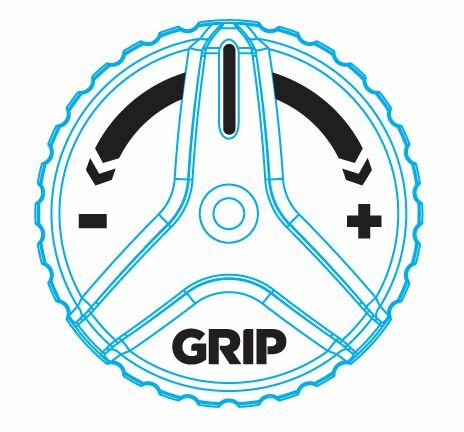 Sag is the amount your suspension compresses under your weight and riding gear. Sag range should be set to 15–20% of total fork travel. Unscrew the air cap on top of the left fork leg counter-clockwise to expose the Schrader valve. Attach a FOX High Pressure Pump to the Schrader valve. Pump your fork to the appropriate pressure as listed in the 'Suggested starting points for setting sag' table below, then remove the pump. Using your forks sag setting o-ring on the left upper tube (or temporarily install a zip tie to the upper tube), slide the o-ring (or zip tie) down against the fork dust wiper. Rotate the LSC adjuster fully counter-clockwise. Dressed to ride (including a filled hydration pack, if you use one), position your bike next to a wall or table to support yourself. Mount your bicycle. Assume your riding position for at least 10 seconds, allowing the suspension to fully settle. Make sure you distribute your weight evenly between the saddle, handlebars and pedals. While in your riding position, slide the o-ring (or zip tie) down against the fork dust wiper. Dismount your bike without bouncing, to avoid further moving the o-ring or zip tie. Measure the distance between the dust wiper and the o-ring or zip tie. This is your sag measurement. Suggested sag measurements are listed in the table below. Add or remove air pressure until your sag measurement is between 15-20% of your forks total travel. Repeat steps 4-8 and recheck sag measurement. When sag measurement is correct, screw the air cap on clockwise until snug. The rebound adjustment is dependent on the air pressure setting. For example, higher air pressures require more rebound damping. Use your air pressure to find your rebound setting. Turn your rebound knob to the closed position (full clockwise) until it stops. Then back it out (counter-clockwise) to the number of clicks shown in the table below. Adjust rebound until when tested, the fork returns quickly but does not top out. Top out is felt when a fork fully extends too quickly and comes to an abrupt stop when it reaches full extension (you will hear/feel a small noise). Top out should be avoided through proper rebound setting. Adjusting your high and low speed compression setting controls how the fork feels as it's compressed through its travel under various types of hits. Use your high and low speed compression adjusters to tune the fork to meet your riding style and terrain. High-speed compression (HSC) adjustment is useful to control fork performance during bigger hits, landings, and square-edged bumps. 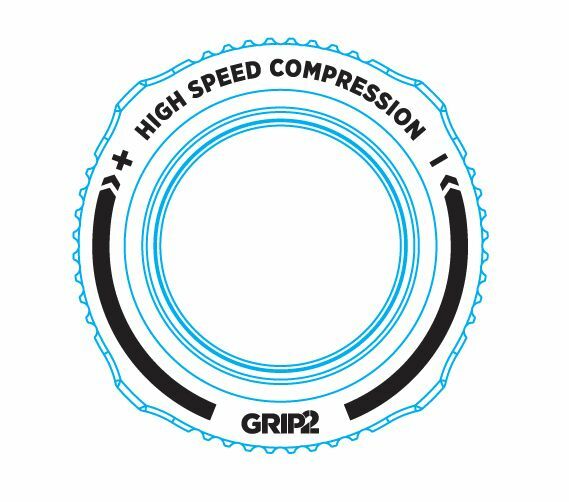 Low-speed compression adjustment is useful to control fork performance during rider weight shifts, G-outs, and other slow inputs. 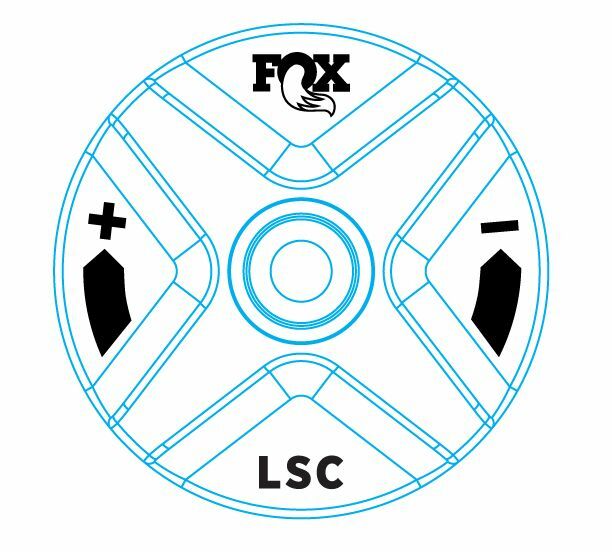 FOX recommends turning adjusters fully clockwise until they come to a gentle stop (approximately 2 in-lb/ 0.2 Nm torque) then turning counter-clockwise to the recommended setting. Any High-Speed Compression settings beyond 16 clicks out from fully closed do not change damping. While the HSC adjuster may have more than 16 detent clicks, only the 16 positions closest to fully closed are designed for use. Any clicks beyond 16 out from fully closed are due to the configuration of the adjuster and will not affect performance in any way. 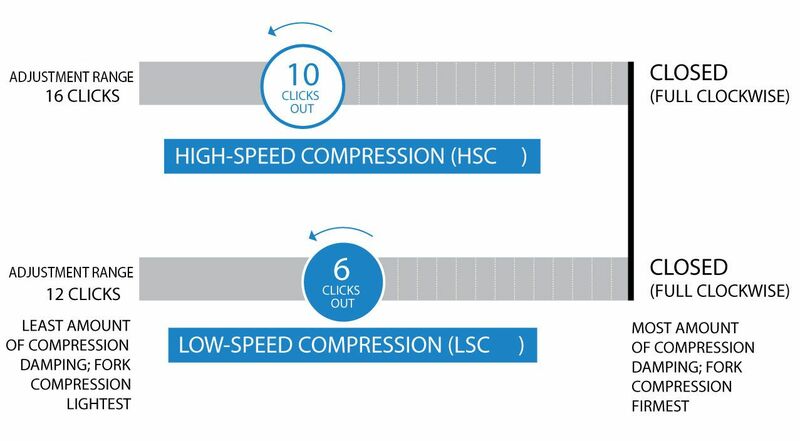 FOX recommends beginning with the High-speed compression set 10 clicks out (counter-clockwise) and Low-speed compression set 6 clicks out (counter-clockwise) from closed (full clockwise). Adjusting your low-speed compression setting controls how the fork feels as it's compressed through its travel under various types of hits. 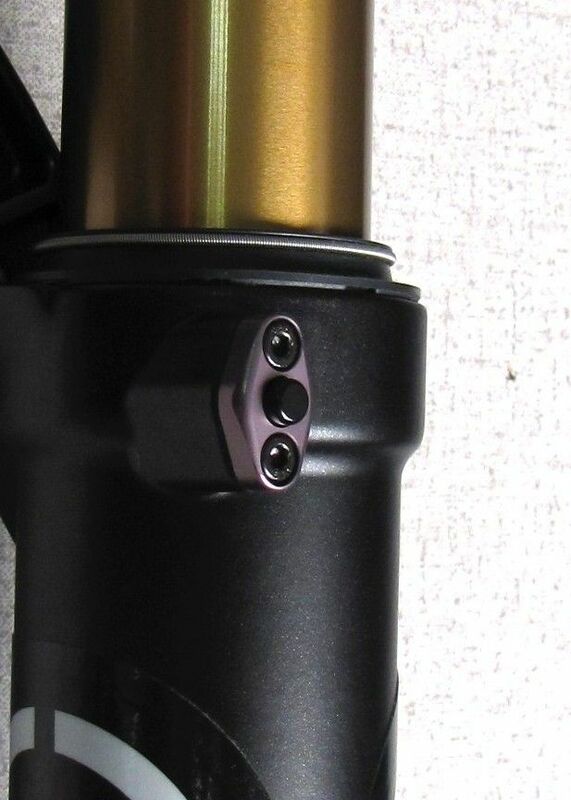 Use your low speed compression adjusters to tune the fork to meet your riding style and terrain. Low-speed compression (LSC) adjustment is useful to control fork performance during rider weight shifts, G-outs, and other slow inputs. Changing volume spacers in the 40 FLOAT fork is an easy internal adjustment that allows you to change the amount of mid stroke and bottom out resistance. If you have set your sag correctly and are using full travel (bottoming out) too easily, then you could install one or more spacers to increase bottom out resistance. If you have set your sag correctly and are not using full travel, then you could remove one or more spacers to decrease bottom out resistance. *DO NOT EXCEED THE MAXIMUM NUMBER OF VOLUME SPACERS LISTED ABOVE! The following instructions guide you through the removal or installation of the FLOAT volume spacers. Remove the blue air topcap (black on Stealth models). Release all air pressure from the fork by depressing the Schrader valve. Carefully unthread the topcap from the fork with a 6-point chamfer-less 32mm socket (available from FOX PN: 398-00-605). Pull up to remove the topcap from the fork crown. 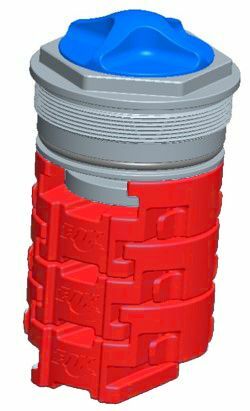 Slide the air volume spacer or spacers horizontally to install or remove from the topcap. Reinstall the topcap into the fork crown and tighten to 220 in-lb (24.8 Nm) torque with your 6-point chamfer-less 32mm socket. Add air pressure to your desired setting using a FOX high pressure pump. 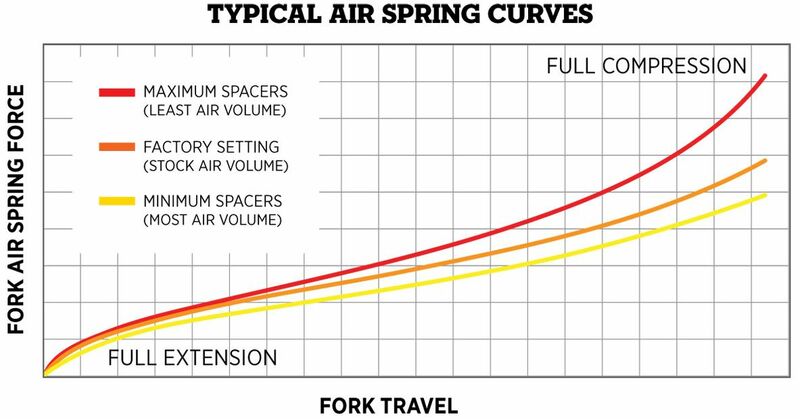 See the Setting Fork Air Pressure section for more information. WARNING: Never attempt to modify air volume spacers, as this can damage your fork causing a loss of control of the bicycle leading to SERIOUS INJURY or DEATH. WARNING: FOX suspension products contain pressurized nitrogen, air, oil, or all 3. Suspension misuse can cause property damage, SERIOUS INJURY OR DEATH. DO NOT puncture, incinerate or crush any portion of a FOX suspension product. DO NOT attempt to disassemble any portion of a FOX suspension product, unless expressly instructed to do so by the applicable FOX technical documentation, and then ONLY while strictly adhering to all FOX instructions and warnings in that instance. WARNING: Modification, improper service, or use of aftermarket replacement parts with FOX forks and shocks may cause the product to malfunction, resulting in SERIOUS INJURY OR DEATH. DO NOT modify any part of a fork or shock, including the fork brace (lower leg cross brace), crown, steerer, upper and lower leg tubes, or internal parts, except as instructed herein. Any unauthorized modification may void the warranty, and may cause failure or the fork or shock, resulting in SERIOUS INJURY OR DEATH. The Air Release Button at the rear of each fork leg allows the rider to equilize the air pressure between the inside of the fork lower leg and the atmosphere. This can be especially helpful at higher altitudes where the internal/external pressure differential can be its greatest. Make sure your fork is in an upright position and the exterior is clean of any dirt/debris. Always cover the Air Release Buttons with a rag before pressing to prevent any oil spray. Make sure to hold the buttons down for at least 5-10 seconds to allow for all air to be released. WARNING: FOX products should be serviced by a qualified bicycle service technician, in accordance with FOX specifications. If you have any doubt whether or not you can properly service your FOX product, then DO NOT attempt it. Improperly serviced products can fail, causing the rider to lose control resulting in SERIOUS INJURY OR DEATH.